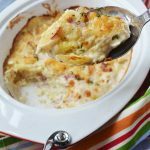 Looking for another easy appetizer string to add to your bow? 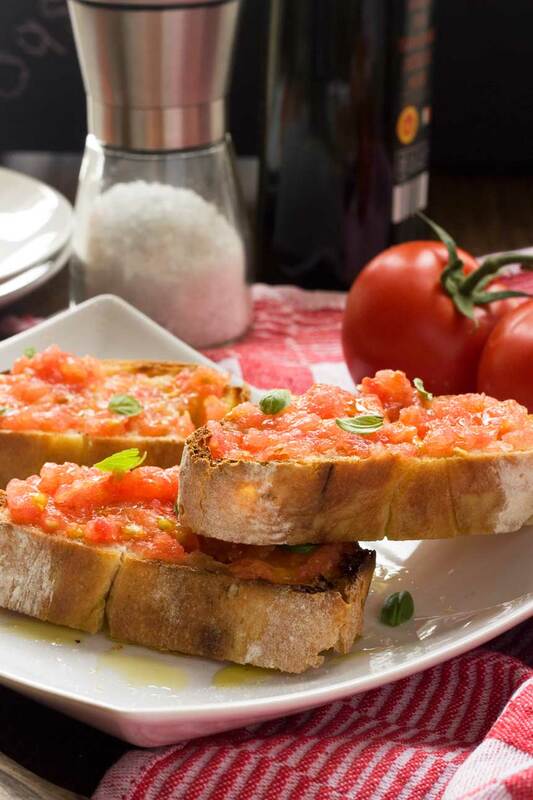 Allow me to suggest this Spanish version of bruschetta (known in Spain as pan con tomate). It’s delicious, and the good news is that it’s just as easy if not easier to make as the Italian version. If I had to sum up this Spanish bruschetta, I’d say that it’s far far tastier than the sum of its parts. For something with so few ingredients – just toasted bread slices, good tomatoes, garlic, salt and loads of olive oil – it’s mind-blowingly good. I first ‘discovered’ it on a 3-month stint in Spain when I was a student many moons ago, then ‘rediscovered’ it on a recent trip there. If you’ve ever been to Spain, you’ll already know that you can get pan con tomate in pretty much any cafe. 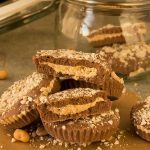 It’s a really popular snack, and I’ve never had a bad one, which to me suggests that you can’t go wrong if you make it yourself! To be honest with you, the only reason I made it this last weekend was because I wanted to make something for the blog but was short on time, and this is what Mr. Scrummy very helpfully suggested that I make. Poor Mr. Scrummy usually gets swiftly put in his place when he suggests things to make for the blog. He’s told bluntly that his idea isn’t original enough, or probably won’t be popular with readers, or something similar. What a mean wife I am. But when he suggested this, I jumped at the idea – partly relieved to be able to reassure him that I don’t always pooh-pooh his ideas, but also genuinely excited about posting something that I love and am pretty sure you’ll love too! So how do you make pan con tomate? 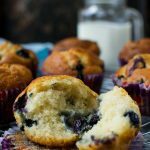 Most likely you already have these ingredients at home – perhaps apart from the bread which you can easily run out and get. 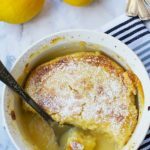 The most important thing if you give this a go is to use the very best ingredients you can find. Because there are only a few ingredients, they’re all the stars of the show if you know what I mean. 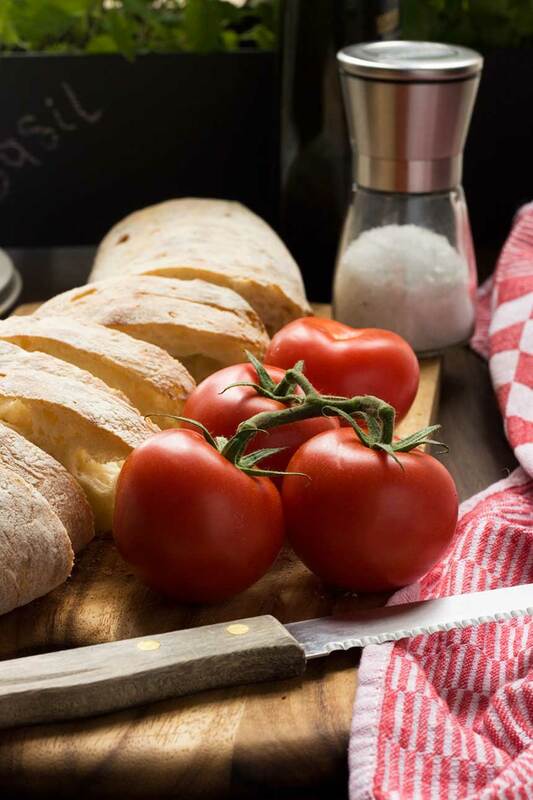 So get freshly made Mediterranean-style bread that you love (ciabatta or French baguette is fine), try to find big, juicy, in-season tomatoes, and a really good quality olive oil. 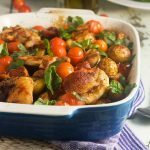 Pay particular attention to that olive oil, because you’re going to slosh quite a bit of it all over those gorgeous squished tomatoes. So yeah, you have to squish the tomatoes! And get rid of the skin. But don’t worry because it’s the easiest thing in the world to do. Honestly, it is. You just slice each tomato in half, then rub it through a box grater (standing in a bowl) with the palm of your hand. You’ll end up with squished pulp that looks a bit like a simple tomato sauce, and the skin will be left quite neatly in your hand. This is what the tomato pulp looks like after you’ve pushed it through the grater. Pile it onto the bread, leaving the most watery part behind! 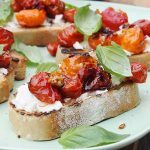 Another delicious bruschetta recipe: slow-roasted tomato and ricotta bruschetta… mmm! Once you’ve got your tomato pulp, there’s hardly anything else to do. You literally just grill or broil your bread on both sides, drizzling a little olive oil over before you cook the second side. Then, you cut a garlic clove in half and rub the cut side lightly over the bread, pile on the tomato pulp, grind over plenty of salt, and finally drizzle with more olive oil (don’t miss this part out). I like to finish with a few leaves of basil, but that’s totally optional. The Spanish eat this for breakfast, which might seem strange, but believe me – enjoying one or two of these and a good old café con leche at a pavement café in the sunshine can NOT be beaten. But let’s for argument’s sake assume that you’re not in the Mediterranean. You’re at home and putting up with a mostly indoor, sunshine-less reality (that’s me). These are still GREAT – as a mid-morning or mid-afternoon snack for yourself, or as a really simple canape or appetizer for guests. Treat these just as you would bruschetta, basically. Who doesn't like a really well done bruschetta? 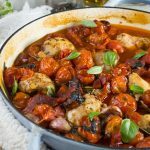 This Spanish version, otherwise known as pan con tomate, takes just 10 minutes from start to finish to make, but tastes divine! Cut the tomatoes in half, then grate them coarsely into a bowl with a box grater by rubbing the cut side against the grater with the flat of your hand. Continue until you’re left with just the skin. 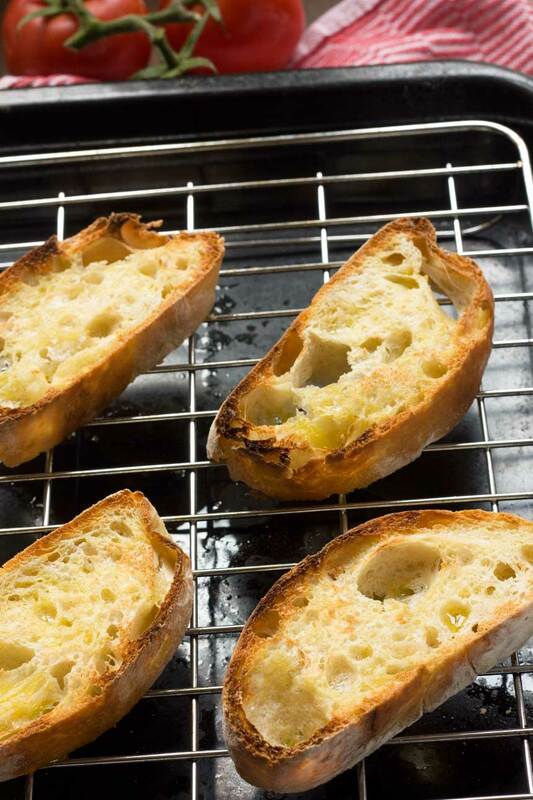 Grill or broil the bread on one side, then drizzle a little olive oil over the other side and grill or broil that side too. Lightly rub the top of each piece of bread with the cut side of half the garlic clove. Pile the tomato pulp onto the bread (leaving behind any excess water), sprinkle with salt, drizzle with more olive oil and scatter over a few basil leaves (if using). Serve immediately while the bread’s still warm. *Double/Triple/Quadruple this recipe to make canapes. Simply use smaller rounds of bread e.g. French baguette. The simple recipes of Europe are always my favorite. With just a handful of ingredients you can go from boring to amazing in one quick sweep. So, did you go running with bulls in Spain? Spain is on my culinary bucket list. You’ve summed it up perfectly, Bam – from boring to amazing! It’s so beautiful, I want some!!!! Hi Amy – so happy it had this effect on you! Who’d have thought tomatoes on bread could be so good? And it is! I am drooling over this dish at 7:30am before my breakfast. Great recipe. You are so right! 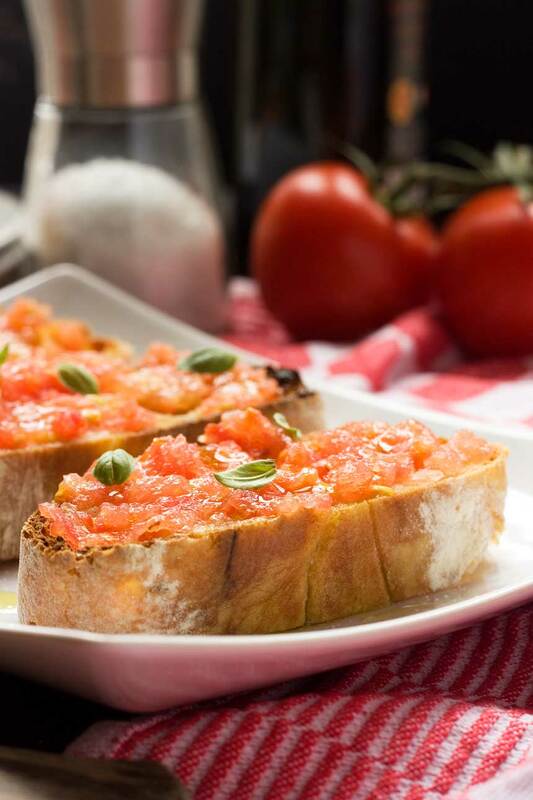 For something with such few ingredients, this bruschetta certainly packs flavor! I remember making bruschetta in a cooking class I took while going to school in Italy (also many moons ago) ;), and it’s so amazing how delicious something so simple can be! 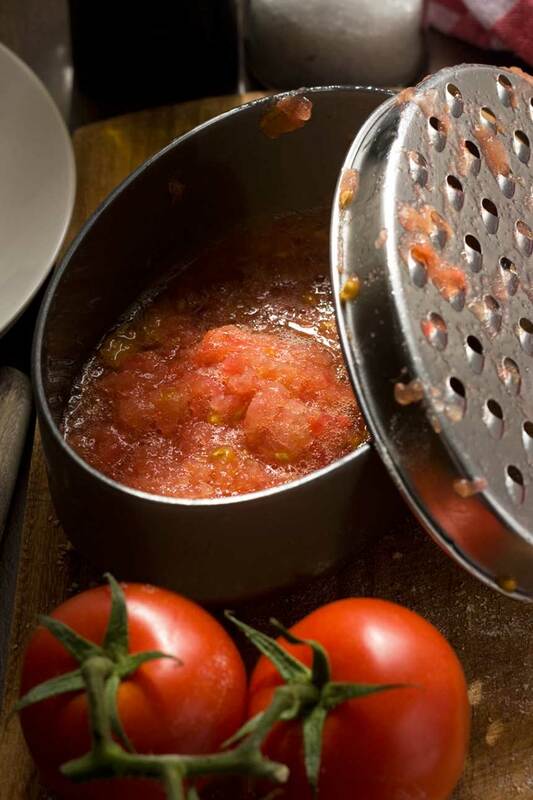 I’ve never tried grating the tomatoes to get the pulp – what a fabulous idea! Definitely trying it this way next time! Do give this way a go, Kathleen – it works really well. That cooking class you went to sounds wonderful – would love to do something like that! 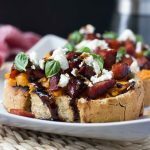 Love this Spanish bruschetta recipe, Helen! Looks delicious! 🙂 I usually eat this most days for breakfast ever since I first tried it in Mallorca a few years ago. Can’t wait to try this bruschetta and make your halloumi fries again! 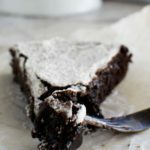 Really – you eat this every day? I should do that too – it’s just so delicious, I could easily eat this every day too! 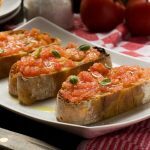 Such a simple dish indeed – but these Spanish bruschetta sound so delicious – I’ve gotta put this on my list of weekend brunch eats to tr. I have to admit, Helen, tomato skin isn’t my favorite – so I am so loving that the pulp only is used in these! I absolutely love pan con tomate! There’s something about the tomatoes, oil and crunchy bread that tastes SO good! 😀 I’ve only ever ordered it though, but I’m really inclined to make it now that I know it only takes 10 minutes! Hope you do give it a go, Lorraine – you’ll make it again and again! I haven’t had Spanish bruschetta yet, but just looking at it I can’t wait to try it! Looks amazing! 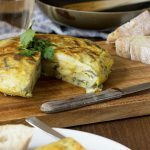 Love simple European recipes like this one! Pinned! Wow, for such a simple recipe, the flavors look fantastic!! Great suggestion, Mr. Scrummy! This is a must try! 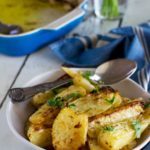 I thought you might approve of a simple Mediterranean recipe! This looks DELISH Helen, I’m seriously craving bruschetta right now! I love how simple food can taste so good! Thanks, Denise – you have to try this. It’s a classic example of simple food tasting good! J’adore le “pan con tomate” ! Quand je vais en Espagne j’aime bien le mangé pour l’apéro. Mon père et mon mari adorent cette recette pour le petit déjeuner. En tout cas, c’est simple et tellement bon à n’importe quel moment de la journée. In fact, it isn’t a Spanish dish, it is typical from Catalunya and it’s called “pa amb tomata”. We do it by cutting a tomato in halves and rubbing it directly on the bread, then a bit of olive oil and that’s it! Bon profit! Thanks for the interesting info, Marta. I’ve eaten it in Catalunya but I didn’t know it came from there! In any case, it’s delicious! Made too many of these ‘pan de tomate’ for a small dinner party. Big hit. Make by hand with grater to get proper consistency. Low tech, but just wrong any other way. Will use the few pairs of leftovers for breakfast warmed with poached eggs on top. Scrumptious or what? Agreed! I absolutely love these. So simple and yet so delicious. Love your idea of adding eggs! Hi Pat! Oops, sorry! You rub the cut side of half of a clove of garlic lightly onto each slice of bread before you pile on the tomatoes (because the garlic’s raw it can be pretty strong which is why you only rub it fairly lightly). I’ll add it to the recipe instructions!